Cocksfoot (Dactylis glomerata L.) is a strongly tufted, deep-rooted, long-lived perennial reaching a height of 60-150 cm. Culms are erect and glabrous. Leaf blades are 30-60 cm long and 5-10 mm broad. Inflorescences are erect panicles, 8-20 cm long, bearing spikelets in dense one-sided clusters. Cocksfoot produces a continuous growth of young leaves and can withstand heavy grazing (Göhl, 1982). It is used for pasture, hay and silage (Ecoport, 2010; Ecocrop, 2010). The main advantage of cocksfoot is greater forage production during summer compared to other forage grasses: it stays green after most prairy grasses have dried (USDA, 2010). Because of its shade tolerance cocksfoot is also used in Europe to establish vegetation cover in vineyards or orchards (Sanada et al., 2010). Numerous cultivars of cocksfoot have been developed for late maturing, higher leafiness, higher productivity, better disease resistance, wider adaptability and nutritive value (Hannaway et al., 1999). Cocksfoot is native to Europe, Asia and North Africa. It was introduced to North America, New Zealand and Australia where locally it may be considered as an invasive species. It is found from 0° to 70° latitude but grows better in temperate and sub-tropical regions. In Kenya, it is found above an altitude of 2350 m (Ecoport, 2010). Optimal growth conditions are annual day-temperatures ranging from 4.3°C to 23.8°C, annual rainfall from 480 mm to 750 mm, on normally drained to dry soils, rich soils of heavy types such as clays and loams, with a pH ranging from 4.5 to 8.2 (Ecoport, 2010; Duke, 1983). It is tolerant of shade, high temperatures and drought (Ecoport, 2010) but does not appreciate excessive humidity (FAO, 2010). As a cool-season perennial, cocksfoot may be harvested four times a year and remains productive during 4 to 8 years (GNIS, 1987). Hay yields may be up to 13.5 t/ha with adequate fertilizer and up to 5-6 t/ha with no additional fertilizer (Ecoport, 2010; Ecocrop, 2010; AGRICE, 1998). Cocksfoot is tolerant of shade and is an ideal companion grass for legumes in mixed permanent pastures (Ecocrop, 2010). It is suitable for mixed sowing with alfalfa (Medicago sativa L.) or red clover (Trifolium pratense L.) for hay or white clover (Trifolium repens L.) for grazing (Sanada et al., 2010). However, it is in very competition with white clover for water and nutrients when the two species are sown together. Cocksfoot dominant pastures often have a low nutritional value and can be difficult to manage by grazing (Mills, 2007). It may also be used as a ground cover, in order to control soil erosion and for lawns or ornamental borders (Duke, 1983). Cocksfoot does not produce seed in the tropics because of the shorter summer photoperiod. It can be propagated from imported seeds or planted slips (Göhl, 1982). 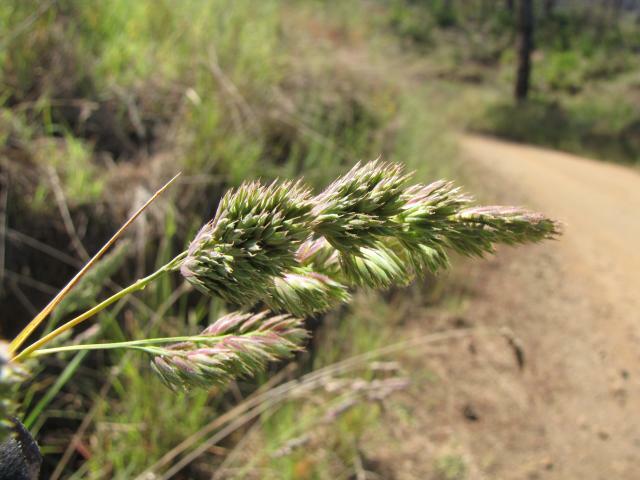 As a deep-rooted perennial grass, cocksfoot is an excellent ground cover and may be used in rehabilitation programmes: for example soil erosion control on cut-over forest land or on slopes, and rehabilitation of sites disturbed by mining (Quattrocchi, 2006). Once established it may be cultivated without additional fertilizer and without pesticides (AGRICE, 1998). However it is preferred by livestock when grown with adequate plant nutrients (Voisin, 1988). Cocksfoot is one of the richest temperate grasses as measured by protein content. In Western Europe, protein content is usually between 15-20% DM, although 25% protein is possible in young cocksfoot grass (INRA, 2007). However, values higher than 30% protein have been observed in New Zealand (Edwards et al., 1993). The protein content declines with maturity, and can be lower than 10% DM at the end of flowering. This high protein content is counterbalanced by a fibre content (crude fibre 25-30% DM) that is often higher than that of other grasses (notably ryegrass and fescue) at the same stage of maturity stage (INRA, 2007). Cocksfoot is free of alkaloids and mycotoxins (Barnes et al., 2007). The association of cocksfoot with alfalfa can help to reduce the incidence of bloat. In steers, for example, the presence of 25 to 50% cocksfoot in an alfalfa pasture reduced frothy bloat by 70 to 90% (Veira et al., 2010). Cocksfoot is a lesser magnesium accumulator than other grasses, notably fescue and is therefore more prone to be associated with grass tetany or hypomagnesaemia (Vignau-Loustau et al., 2008; Cherney et al., 2002). Cocksfoot is very valuable for pasture, silage and hay in humid temperate climates. Regrowth is abundant in autumn, which allows for a lengthier grazing period and therefore for more profitable milk and meat production (GNIS, 2011). For example balanced cocksfoot dairy rations can be well utilized by lactating dairy cattle, resulting in higher yields than alfalfa, provided that grass is harvested at a high yield and quality (Jonker et al., 2002). Cocksfoot has to be cut at flowering stage to ensure it is nutritious (high protein content), and also to promote growth of palatable tillers (GNIS, 1987; Piccioni, 1965). There is abundant literature concerning the use of cocksfoot pasture, hay and silage for all ruminant species and production pathways in temperate regions, including elk and red deer. Another important field of study is the optimization of cocksfoot use in association with legumes. Cocksfoot is often the grass of reference in ruminant feeding trials in temperate countries. 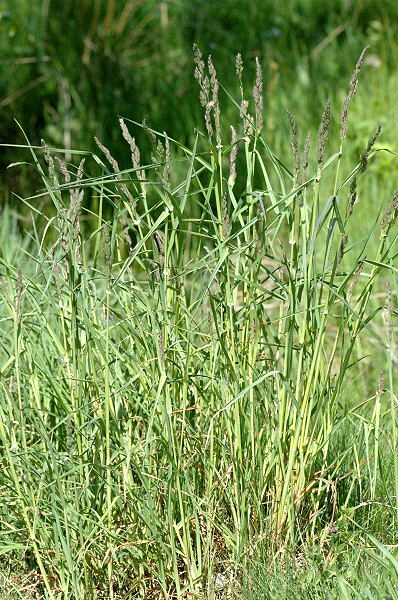 Given the large number of specialized Dactylis glomerata varieties available commercially, a meaningful survey of the literature is beyond the scope of this datasheet, and the reader is invited to consult the local extension services in their area for more information on cocksfoot management strategies. Cocksfoot is sometimes described as being highly palatable (USDA-NRCS, 2006). For instance, in palatability trials carried out in the USA in the 1950s, it was the most relished grass when grazed by cows in pastures sown with other grasses such as fescue, Poa pratensis, timothy or brome grass (Voisin, 1988). 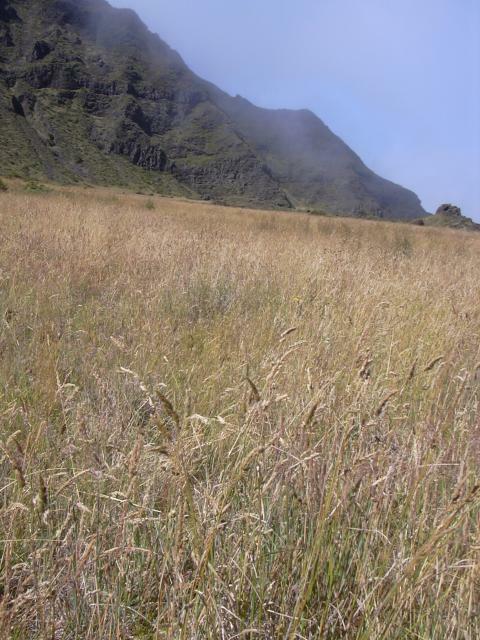 In more recent trials in New Zealand, grazing calves preferred orchard grass (cocksfoot) over timothy, fescue, ryegrass and legumes (Hunt et al., 1990), High-protein cocksfoot was found to be as palatable as other grasses (Edwards et al., 1993). However, other observations are less positive and cocksfoot has been found to be of low or moderate palatability. These variations can be explained by the protein content or by the variety (Reid et al., 1966; Mizuno et al., 2000; Mills, 2007). In grazing sheep, cocksfoot intake rose with increasing levels of nitrogen fertilizer (Reid et al., 1966; Zhang JiMin et al., 2004). Animals can adapt their intake to grazing conditions: in Argentina, heifers grazing mature cocksfoot regrowths used shorter grazing times and shorter bite rates, resulting in larger intakes (Acosta et al., 2006). While good, the nutritive value of cocksfoot is somewhat lower to that of highly digestible grasses such as ryegrass (Sanada et al., 2010; Gallais, 1972) or fescue (Schubiger et al., 1997). The variation in nutritive value is large and can be explained by the stage of development and variety (Schubiger et al., 1997). Ranges for OM digestibility and ME values are given in the following table for cocksfoot grown in Western Europe. In New Zealand, Mills, 2007 reported ME values of 10.2-12.4 MJ/kg for cocksfoot pasture. The ME was lower in late spring and summer compared to autumn and winter. The digestibility of protein is influenced positively by the level of additional fertilizer (Reid et al., 1966). In sacco N degradability in fresh cocksfoot decreases with the age of the forage from 69% at heading to 59% at flowering. It was higher for silages (70-77%) and lower for hay (53%) harvested at the same stage (Aufrère et al., 2003). The traditional practice of raising pigs outdoors on forage and pasture has been coming back in numerous countries as an alternative approach to pig farming. For instance, EU standards of organic pig production require that breeding animals have access to pasture (Blair, 2007). In addition to environmental and societal benefits, its main advantage is a reduction in feed costs, particularly for gestating sows (Duval, 1993). However, grass pastures are too fibrous for young pigs and may not supply enough protein and energy for growth. In all cases, access to concentrates, minerals and vitamins supplements may be required (Blair, 2007). A cocksfoot-clover pasture sown in spring or early autumn can be grazed after five or six months and support 50-62 pigs (45 kg/head) per ha. An alfalfa-cocksfoot pasture can be valuable as alfalfa ensures palatability while cocksfoot brings ground cover (Duval, 1993). A sow diet containing 25% dried cocksfoot, 57 % maize grain and 14% of soybean meal has been proposed (Blair, 2007). In breeding sows, the consumption of forage (pasture of cocksfoot, ryegrass and alfalfa) and/or soil rooting provided a dietary source of vitamin E and Se that resulted in increased concentrations of milk Se and α-tocopherol. Pastures that contained predominately grass species had lower α-tocopherol contents than those with alfalfa (Mutetikka et al., 1993). In Poland, a pasture of Poa pratensis, Festuca rubra and Dactylis glomerata was found to be a good fodder for fattening geese and economically profitable (Kitczak et al., 2004). Cocksfoot is highly palatable for rabbits. 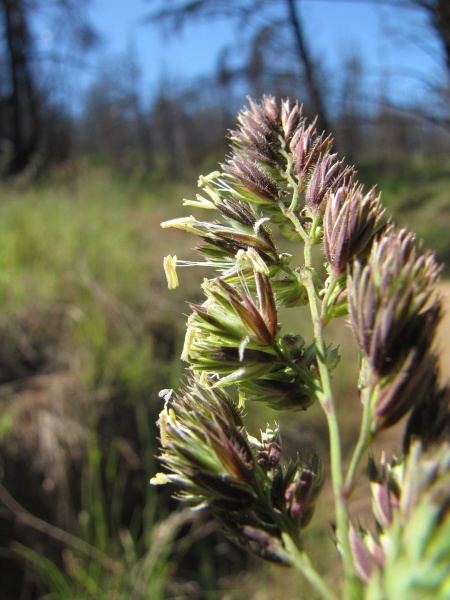 For instance, in non-cultivated areas, the spontaneous intake by wild rabbits of Dactylis glomerata is proportionally higher than the frequency in the species composition of the sward (Duffy et al., 1996; Diaz, 2000; Marques et al., 2001). When offered as green forage to adult domestic rabbits in a preference test, cocksfoot was readily eaten even if some other green feeds are consumed in greater quantities (Harris et al., 1983). In complete balanced feeds, cocksfoot hay may be the main source of fibre for growing rabbits without any problems (Battaglini et al., 1985; Bautista Ortega, 1994). Cocksfoot hay from N-fertilized and non-fertilized plots was used successfully as the only feed source for adult rabbits in 2-week preference tests; rabbits consumed relatively more cocksfoot hay from non-fertilized plots than hay from the N-fertilized plots (Reid et al., 1966). With cocksfoot fed alone (crude protein 27% DM; crude fibre 24% DM) as fresh forage or dried artificially at 55-60°C, drying had a positive effect on crude fibre digestibility (37.3 vs. 27.6%), no significant effect on dry matter digestibility (51.3 vs. 48.2%) and decreased protein digestibility (75.0 vs. 79.5%) (Miller et al., 1954). If locally available, cocksfoot seed screenings can be used with success in diets for growing rabbit up to 30% of the diet (El-Sayaad et al., 1992). Cocksfoot is a good forage for horses, both as pasture and hay. It should be grazed or harvested for hay before flowering otherwise it becomes less palatable for horses. Horses can cut cocksfoot cleanly, unlike cattle who tend to pull it out in tufts (Bertrand et al., 2005). As in ruminants, associations with other grass species (timothy, fescue, ryegrass) and legumes (alfalfa, red clover, white clover) can be valuable depending on the type of horse, soil and type of utilisation (pasture or hay) (GNIS, 2006). Cocksfoot was found to be less palatable to horses than brome, fescue, ryegrass, timothy and white clover, but more palatable than alfalfa and red clover (Hunt et al., 1990). Ground cocksfoot hay has the same nutirient digestibility as pelleted hay (Drogoul et al., 2000a; Drogoul et al., 2000b). In thoroughbreds, DE of cocksfoot hay was found to be in the range 8.5-10.5 MJ/kg DM (Tagaki et al., 2002; Tagaki et al., 2003). Bautista Ortega, J., 1994. Evaluation of pelleted diets high in Orchard grass (Dactylis glomerata) in weaning rabbits. Universidad Autonoma Chapingo, Chapingo, Mexico, 38 pp. Bertrand, Y. ; Halleux, G. de, 2005. Chevaux et prairies. France Agricole Editions, 223 p.
Piccioni, M., 1965. Dictionnaire des aliments pour les animaux. Edagricole, 640 pp. Voisin, A., 1988. Grass productivity. Island Press, USA. 384 p.